There seems to be a few lost birds here in the Peterborough area these days! 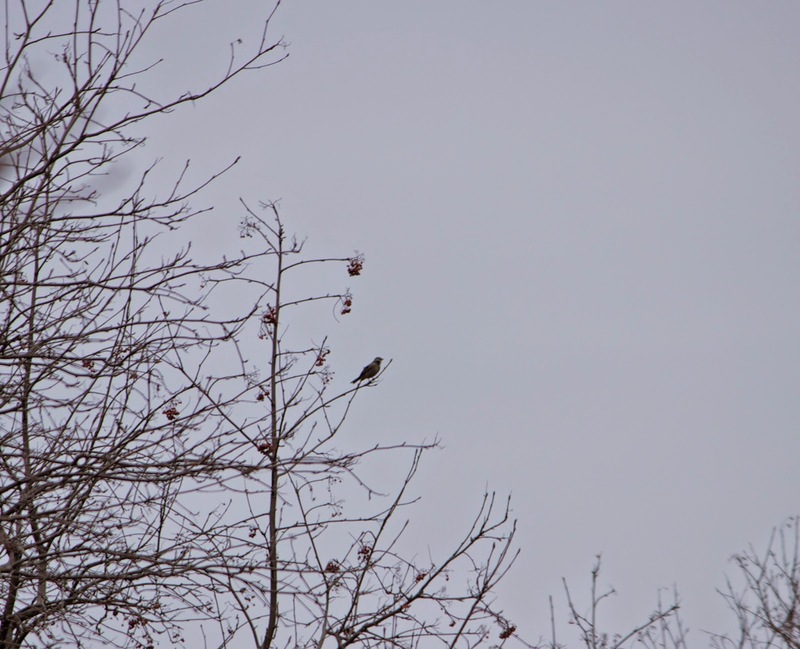 The first to show up was a Townsend Solitaire! Generally these birds are found in British Columbia and a little portion of Alberta, so the fact that one actually ended up here in Peterborough is a little strange! It was first seeing along the hedgerows of someone's lawn out near Rice Lake. It has stayed within the same lawn for the last two weeks now and we suspect it would likely stay there for much of the winter. We first arrived there around 9:30 at the location that it has been regularly seen. Most of the e-bird reports had been from around this time so we were hoping it was a trend! When we first arrived to the site, there were three other cars of people standing around. Only one of them had seen the bird about 40 minutes previously before it flew off over a hedgerow. We all stood around and waited checking nearby bushes and trees regularly for any movements. Of course there were tons of Blue Jays around tricking us...or "mocking". After about 20-30 minutes there was a thrush-looking bird that perched on top of one of the Mountain Ash trees and begun feeding on berries. That was it! 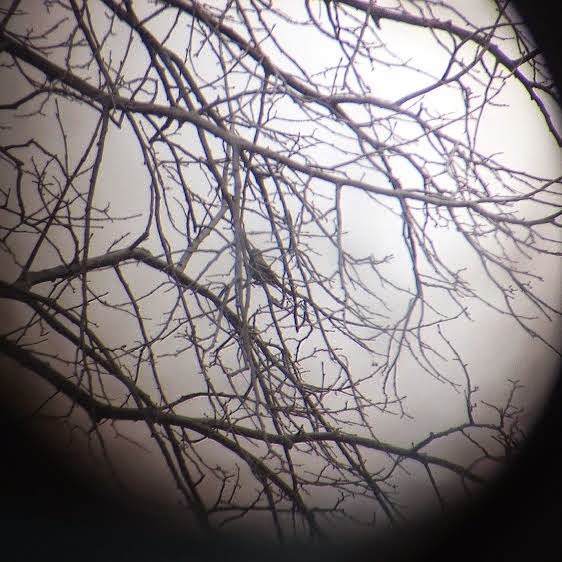 We all were able to get a great look of him through our binoculars before it flew off into some large trees. One man put out his scope so that we could all get a great look. 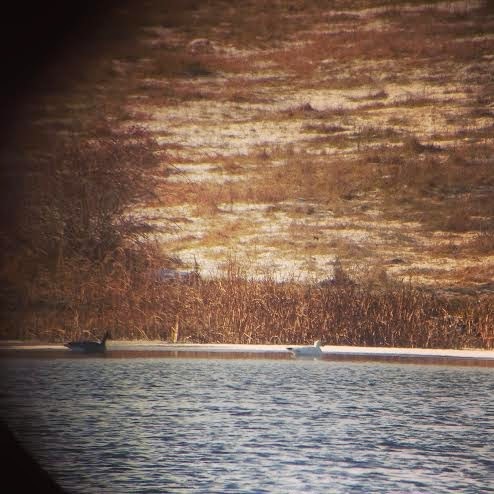 I don't believe any of us actually got a good photo, the distance was far (hence the photo through the scope!) or the lighting (making for many silhouette photos!). After about 20 minutes, the Townsend flew off again into an unknown area. We ended up heading down to a little outlook area on Rice Lake. There were many Herring Gulls, RBGU, Common Mergansers, Goldeneye, and even a Great Black-backed Gull! Otherwise there wasn't too much to report! The second bird of excitement around here was a Ross's Goose! These birds generally are in Manitoba, and another little population on the boarder of Alberta and Saskatchewan. It seems that quite a few of these guys end up coming through Ontario in the winter time. It has been seen along the Otonabee River and most recently feeding in the fields. I took a little break after one of my classes to take a little drive along the river to see if I could spot it. After an unsuccessful drive to the locks, I spotted a large flock of Canadian Geese on the river after a little while. It took quite a while to finally spot it, but I did eventually! What a cutie! The flock was on the other side of the river, so unfortunately I wasn't able to get a photo at all minus one attempt through my binoculars! It was very exciting to be able to see such two "rare" birds in this neck of the woods. I am glad that so many others here were able to see them too! Hopefully there will be a few more exciting finds this winter!